My view on the economy is little changed over the month. I still see the US in an environment of modest economic growth. A second strong payroll number should quiet the concerns that a period of weakness is beginning. 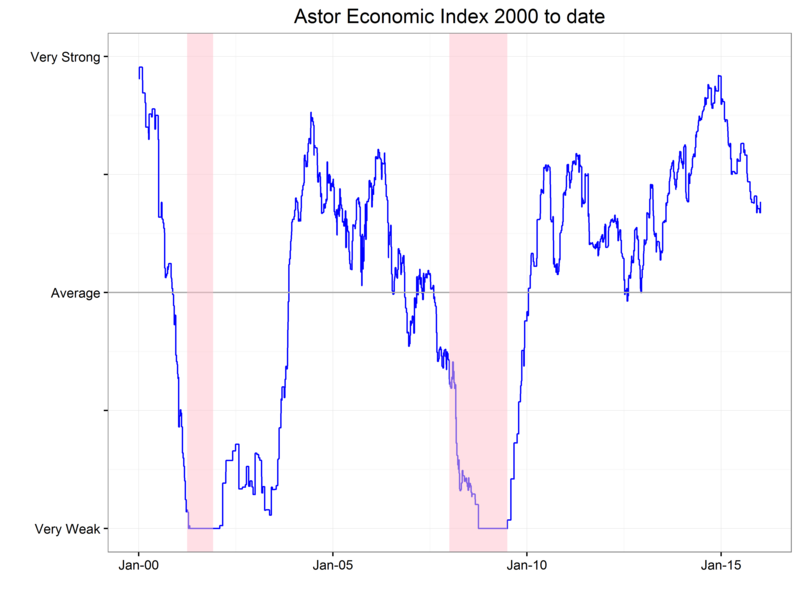 Our latest reading for the Astor Economic Index® (“AEI”) is still near the highest level posted this year. I still see the US as currently growing above average. The AEI is a proprietary index that evaluates selected employment and output trends in an effort to gauge the current pace of US economic growth. The payroll number beat expectations for a second month in a row, relieving concerns that any decline in growth is imminent. There are no obvious signs of weakness hiding in the details and even real earnings are above where they have been in this long, tepid recovery. Nevertheless, economists do expect payroll growth to moderate as the economy nears full employment, where many believe it is today, so don’t be surprised if average jobs growth in the next year is lower than the last few years. The “nowcasts”(1) produced by the Federal Reserve banks of Atlanta and New York continue to show stronger growth in the third quarter than in the first half of the year. The Atlanta Fed is currently forecasting a 3.7% SAAR (seasonally adjusted annual rate) for Q3 2016. The New York Fed forecast for Q3 is 2.6%. These forecasts are significantly higher than not only their own respective final Q2 estimates, but also higher than the BEA’s (Bureau of Economic Analysis) recent release of their preliminary Q2 GDP estimate of 1.2%. The combination of our proprietary AEI and the “nowcasts” cited above make me somewhat confident that today the US economy is doing fine and would require a shock of some kind to tip us into recession. How will the Fed react to the passing of the Brexit vote and the bounce from payrolls? Former Fed Chair Ben Bernanke had a very useful (though a bit wonky) post explaining how the FOMC in aggregate seems to have adjusted its expectations for the near future of the US economy. The positive news is that the Fed has become more permissive in what counts as “full employment”, meaning the Fed should not be in as much of a hurry to choke off growth because of inflation fears. On the disappointing side of the ledger, the FOMC seems to think that the US will grow more slowly in the future with GDP growth around 1.8-2% per year where they were hoping for 2.3-2.5% just a few years ago. The low rate of growth and the continued low level of realized inflation suggest that The Fed sees the natural rate of interest (the level we might expect the Fed Funds rate to gravitate toward over time) to be lower than they calculated it to be before. The bottom line is that the Fed should see the need to do less tightening to get to a neutral interest rate which may make the Fed more comfortable deferring its next hike. In other words, lower for longer once again. Nevertheless, I expect a few Fed speakers to try to remind the markets that they can hike in September, although I still expect a December hike. To be clear, I do not think that another 25bp would have significant effects on the economy. Overall, the economy seems to be holding to the same positive but low growth groove it has been in for the last several months. (1) “Nowcast” is the GDPNow forecasting model of the Federal Reserve Bank of Atlanta and “nowcast” is the Nowcasting report of the New York Fed. This entry was posted in General Firm Info, John Eckstein. Bookmark the permalink.